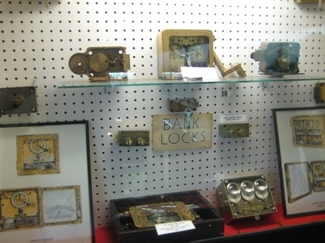 great idea the museum of locks!! is an anusual databank!! I’m looking for a key for a CORBIN DESK DRAWER LOCK. info on the back of the lock is, HB7. 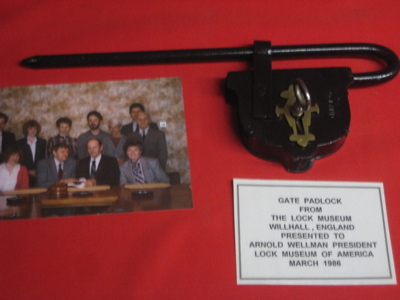 This lock is also used on wwii u.s. feild desk. 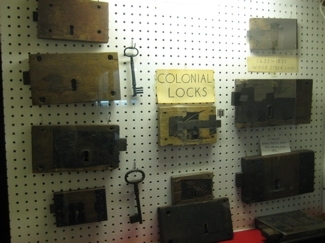 Kip – You should contact the Corbin company, the Lock museum or even the New Britain Industrial Museum. This blog has nothing to do with either. I love your collections! Very extensive! 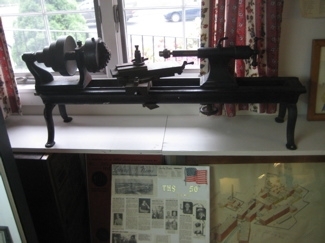 Quick question: have folks created lcoks which a a bit Rube Goldberg? I am looking for something akin to the overly complex locks we see in Lord of the Rings or Hellboy2. Why does this page get the most illiterates who fail to read even the first two sentences? Or the URL for that matter? Wonderful site! Hope to visit on my next trip to Connecticut. Grew up in New Britain and remember Russwin and Corbin locks, of course. 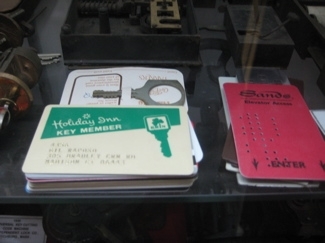 Trivia question: In which Hitchcock movie do Russwin keys play a big part because there’s a missing key from a keychain, and it’s of a different brand, making it obvious that a key is missing? Yeah, so I bought this chastity belt and after locking it noticed I didn’t have the key. Is this something that Connecticut Museum Quest can help me with? I need to get a duplicate old key because I changed my mind about wearing this piece of antique equipment. I’m thinking this was designed in 1759, but how can one be sure? I agree with Miguel, it is a very unusual databank! I never imagined that such a thing could exist. 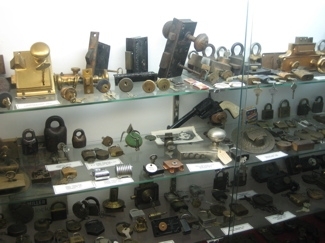 It would be interesting to see the old collections, the first lock systems compared to the actual ones. I have a very (very) old key at home, I have no idea when it was made… and I really don’t need it. Do you think it would be a good idea to donate it to the museum? I have a old 1700 skull and crossbone. Could you tell me how much its worth? hi i have a very old key from The Eaglelock Co and i found it in my basement whinch was built in the 1800’s along with the church where i live. i was just curious what it may be worth or a story behind it. I want you to jam the key into your eye as hard as you can. 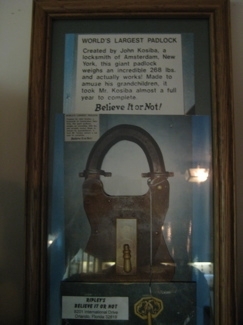 Only then will you see the true story behind that particular lock and key. purchased a trunk. 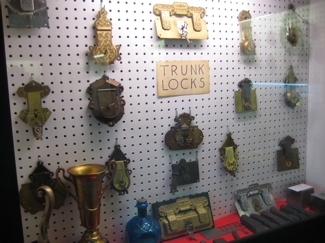 only identifying marks is the lock to help date trunk. eagle lock 410. any idea as to possible manufacturing date for my trunk? any ideas is better than the 1920’s im dating it as. thanks a bunch! Seriously you people are just messing with me now, right? Rachel, PLEASE tell me you’re kidding by asking such an idiotic question here. Wow great collection.Good job dud.. Even though it’s quite clear that this is not my collection at all? And how I repeatedly (yet endearingly) made fun of the guy who actually devoted his life to collecting locks? 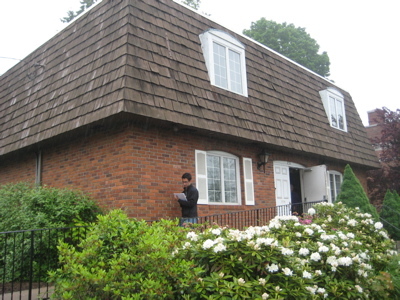 Recently we did a job, modernizing a home. 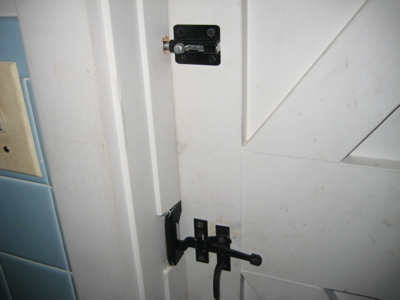 The interior locksets on the doors, both passage & privacy were unknown to us. 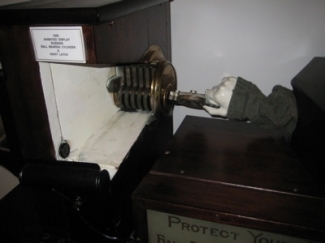 The cut outs were rectangular, & the locks consisted of knobs attached to a shrouded rosette & a latch. It slid into the cut out & secured by two retaining screws, one on either side of the lockset. There are no markings on the locks. We would be able to send you pics of the locks if you provide an address. 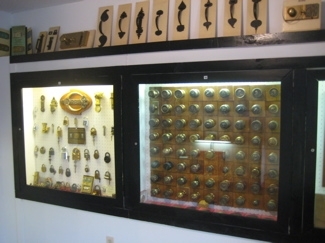 Any help in identifying the locksets would be appreciated. What is a shrouded rosette? You see, I have no idea in the world because – as you’d know if you took 30 seconds to read more than the title of this page, let alone the comments where I have come to enjoy making fun of people like you – I don’t know crap about locks. In fact, it took me something like an entire hour to change a stupid doorknob in my house last year. I’m pretty useless with this type of stuff. Though if you feel compelled to send me pictures, I’d prefer they be of hot Latina women and not some boring old lock thing. Me? 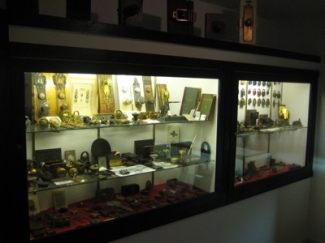 I’d probably seek out an Eagle Lock Co site and not a goofy blog written by a guy who spent half the page above making fun of people who care about old locks. I would like to thank you, though, for continuing this maddening trend of lock-lovers proving themselves to be weird. Hey! I recently lost the key to my bike lock. If you could let me know where it is, I’d appreciate it. I am trying to locate a source for Eagle Lock Company key codes. I have a lock that is missing a key and every locksmith I have been to tells me that the code for that key cannot be found. The lock is very definitely made by Eagle Lock CO. The code is 3ZQ8. 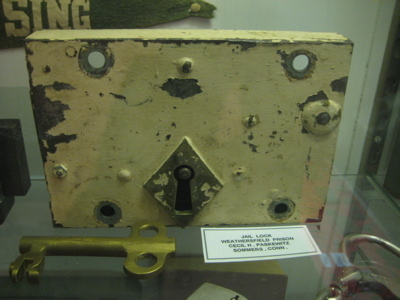 It appears that there was an over strike on the letter “Q”, so it could be a G. This lock is on an old metal lock box. Very secure. 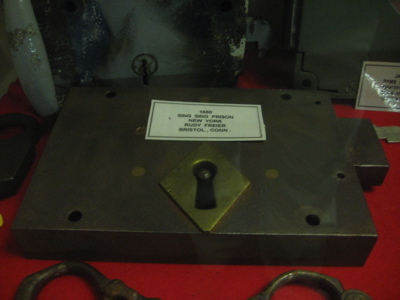 The lock is a half mortise lock measuring 1 3/4″ X1 1/2″. 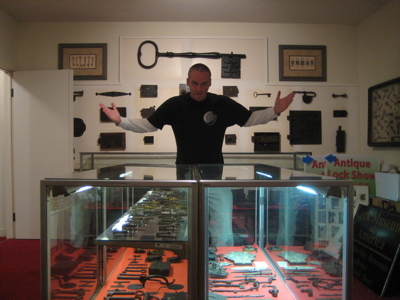 Can you direct me to a source for Eagle lock codes…..please? 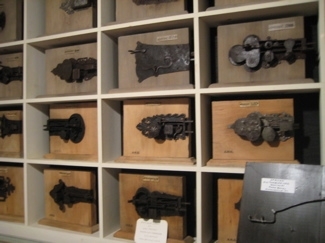 “Every locksmith tells me that the code for that key cannot be found” so I turn to a website about museums and other items of interest in Connecticut named “Connecticut Museum Quest” and a page where the author has posted numerous comments making fun of his readers who failed to read 3 sentences on this website before making their comments. Including one just a week or two ago directly making fun of you, Robert McCrary. I checked. The above moron named “angel” found this site, which doesn’t have the words “corbin” or “lock” in the url via ask.com. He or she landed on the Industrial Museum page, then searched the site for their stupid lock and came to this page. Unbelievably, he or she spent NINE minutes on this page before submitting the idiotic question above. So even though they were on this page for NINE MINUTES, they failed to read a thing, let alone the comments. 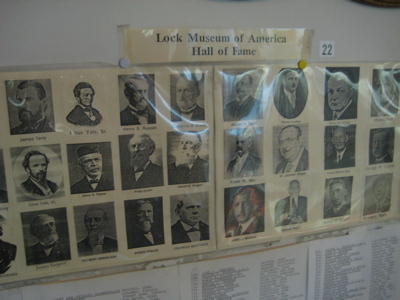 It’s official – lock nerds have taken over from the button nerds on the Button Museum page as the biggest idiots of the nerd collector word. I’m looking for a nieseen 612a. This is incredible. Seriously incredible. A wonderful webpage that was amusing as well as informative, and a spectacular comment page that has people looking at me strangely while I work/cackle. Steve thanks for the report, thorough documentation, and you sparked a rather entertaining discussion page. Strange how ppl use internet these days huh? I have some p&f Corbin new Britain ct keys I have a few questions email me. ???? Sure, I’ll email you. But you won’t like it. hi i have these key.the name on the key is P.F CORBIN NEW BRITAIN CT,and there is a code on the key,so if you read the email,please get back at me.my email address is agnesbelford@yahoo.com,or you can call me at 20364787136.thank you. 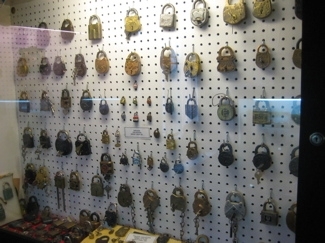 My daughter and I were out “treasure hunting” with our metal detectors one day and among the numerous other items of interest that we found was a miniature padlock about an inch or two down in the soil in a well-traveled dirt roadway between a couple of old sheds in a small town in North Carolina. Actually, we found two of these locks. We found the first one in this road that farm tractors traveled years ago. The second we found over 100 feet away close to the house presently on the property, built in 1953. It is adjacent to the site of the former grand old farm house that once stood close by. It was about the same depth in the ground. I am trying to find a reference that might list or picture this particular lock so I can positively identify it. 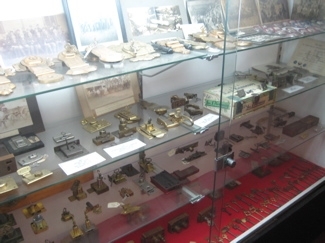 It is small enough to perhaps have been on a jewelry box or maybe even a diary. How can I find a cross reference of old locks made in that area of Terryville? Sorry. I am actually incapable of constructive comments on this page anymore. I have an actual question that follows actually reading your entertaining blog. I saw a would-be review of this museum that said they weren’t open their posted hours. Their website was last updated in 2010, and the phone numbers don’t work. Do you have any idea how to visit this place, or contact the guy that runs it? 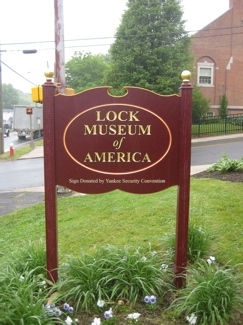 My kid is doing a project on locks, and the museum is about 2 hours away from us, so I thought it would be perfect, but don’t want to drive 2 hours only to have to turn around and come back. BTW, you got really, seriously stupid questions from the interwebs up here. 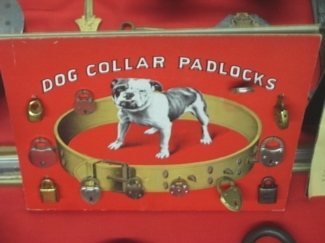 Hi I have a question I was wondering if you might be able to help I have an old trunk with an eagle lock skeleton key when did the company start up do you have an idea of an era they would have made travel trunk locks ? I have a brass plated steel drawbolt lock “Eagle Co” on a wardrobe steamer trunk,about 80 yaers old .I would very much appreciate if you could help me find the corresponding key.There is no numbers or letters to identify the lock. 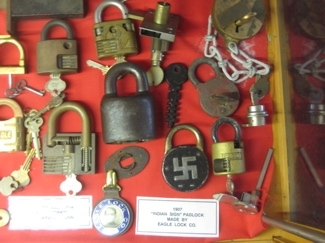 Would the Illustrated Catalogue,Volume n°46[Eagle Lock Co]1930 742pp+sup contain the information for lock identification and therefore the corresponding key number? If so,how can I get to flip through the book on the internet? 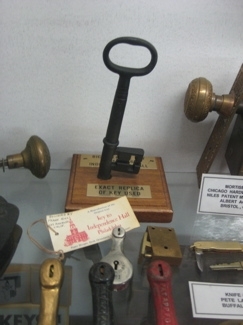 Folks –I am looking for a replacement key for my old trunk made by the Eagle Lock Co. The number is a Eagle 56k2. I tried Brettuns Village web-site but they do not show it available. It is almost impossible to try and contact them– no phone # or e-mail address Help!!! Very interesting site. My husband has a lock that looks very old. It is round,has Eagle lock Co.Terryville,, Connecticut and The name Emerald on one side. Seems like it would be worth something. What do you think ??? I have looked on other sites and can’t find one exactly like it. Steve, Thanks for sharing your love of locks. But mostly Steve, Thanks for the laughs! Steve, It’s painfully obvious that the majority of the population cannot read/comprehend, so I would suggest 2 options: 1. disable the comments for your blog, or 2. keep telling the idiots how obtuse they are, as they are probably not reading what you write in any event. I think the museum is cool, cause I like funky things-and I really admire your restraint in your comments…mine would have been much worse! 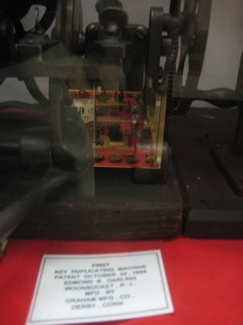 I have a P & F Corbin key, CR 1909796. 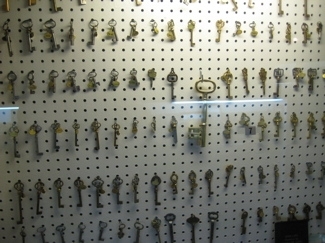 It appears the Lock Museum has many keys but if they are being collected by number, would this be an addition to the museum? Not for sale. I prefer to donate it. Lois i have one of those keys as well. Would you know of a source / locksmith for the corrugated key blanks or a CH85 key. Lee gave me the 7 digit code. I am not sure of the key blank #??? 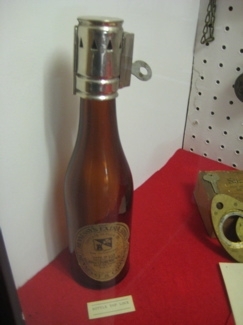 I would like to know the year when it was made…could you help me? Hi, I have just found a CORBIN CABINET LOCK COMPANY key cutting machine which is in a wonderful condition it has the CORBIN CABINET LOCK CO. NEW BRITAIN PATENT SEPT 6th 1910 plate attached to it. Everything is with it and it holds two huge drawers full of blank keys, maybe 1,000. 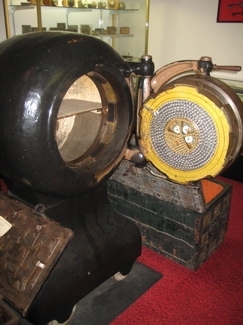 It has numerous brand new cutting tools and one still packed in its original grease package. Everything on it still works and is free moving. Is this a museum piece.